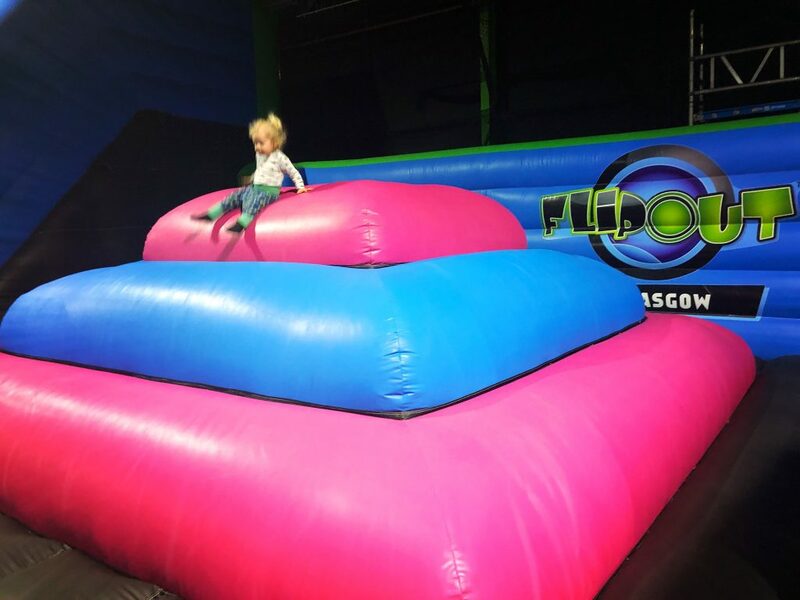 Flip out is now sort of in two halves – one half is inflatables and the other half is trampolines. 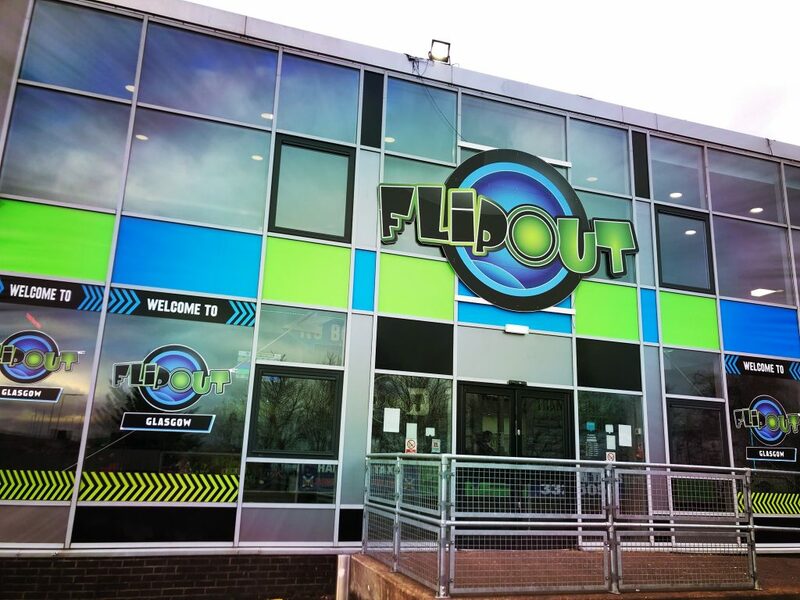 There are a few other bits as well, like the ninja warrior course (for older kids/adults) and their soft play area and big twisty slide. 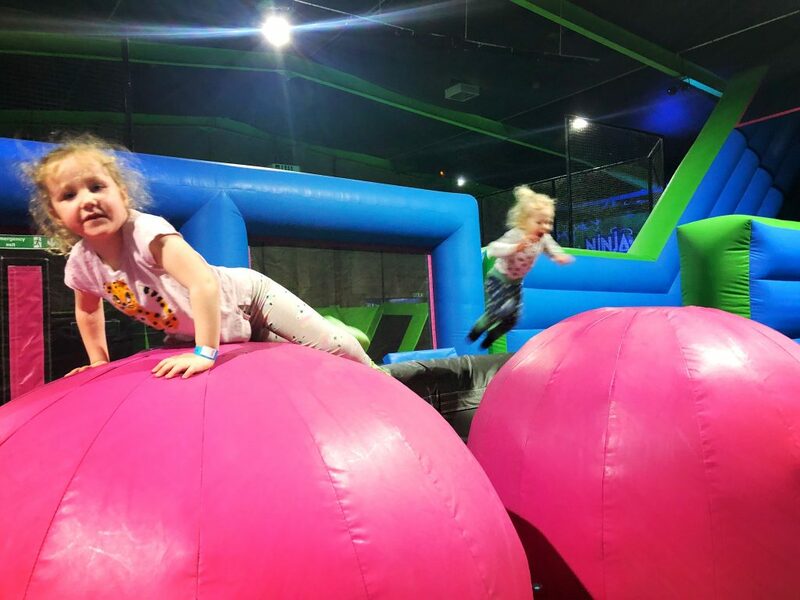 The trampolines still make up a lot of the space in the arena but the inflatables have taken up a good chunk of it too. 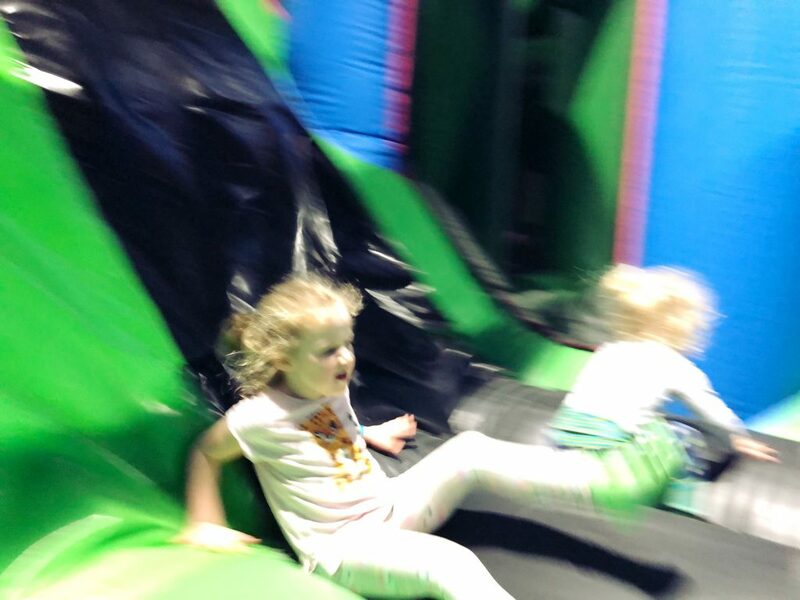 There are inflatable slides and an inflatable hill to climb/bounce down. 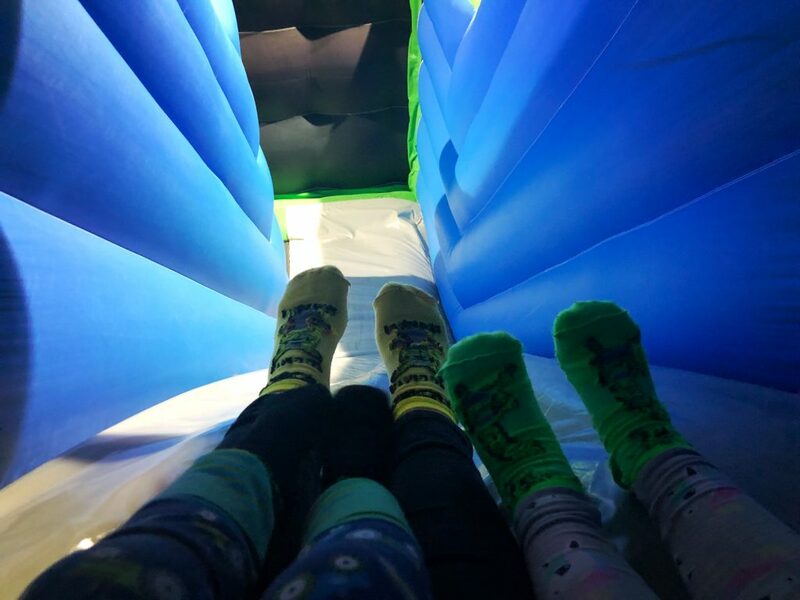 There’s an inflatable maze with bits to climb and bump your way through. 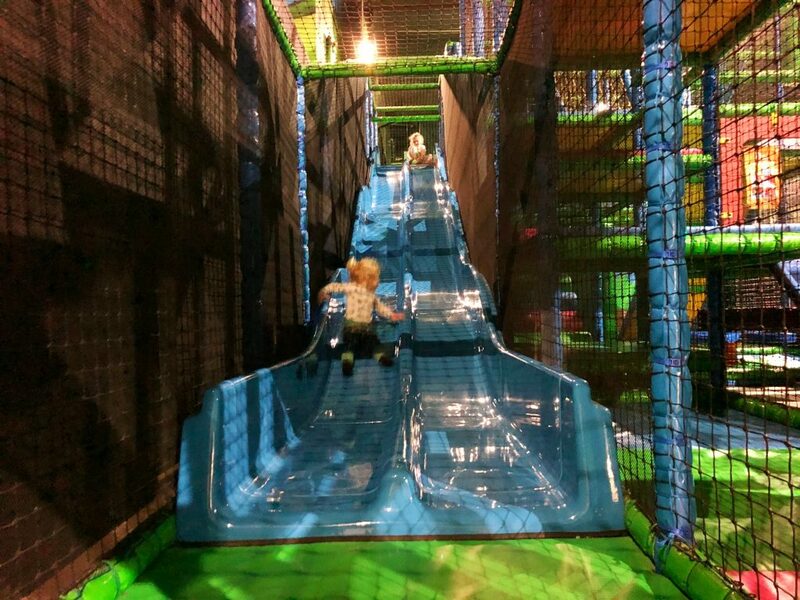 And there’s a wee assault course which has bits to climb up and slide down, a ball pool and ends with 3 side by side slides, so you can race down! There’s also a set of 3 giant balls you can jump along. The kids absolutely loved those. 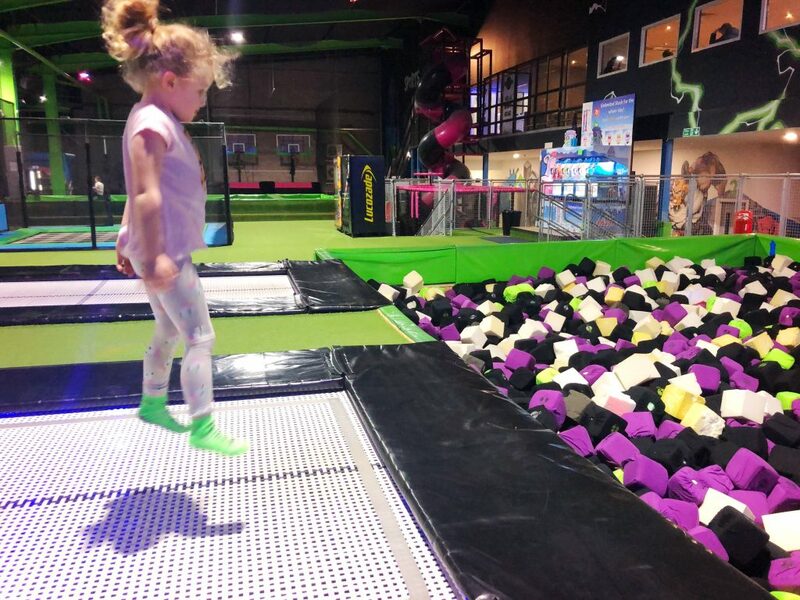 I tried them and they’re slightly more difficult than the little lady made it look… I was knackered by the time we’d played in here a while and we hadn’t even made it into the trampolines yet. We obviously also had to have a play on the trampolines while we were there. 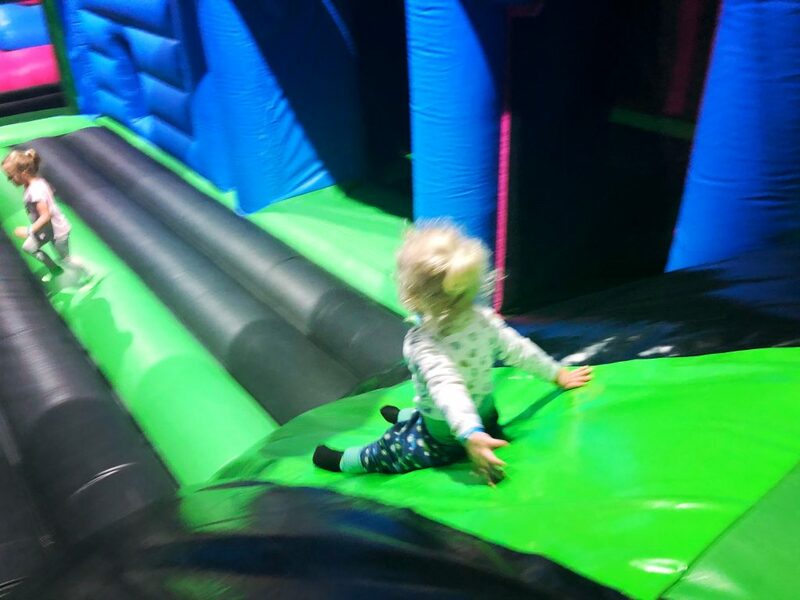 So for about 20 minutes we bounced as high as we could on the big trampolines (a good test of the old pelvic floor strength) and leapt into the foam pits. Well, they leapt into the foam pits – last time I leapt into one I had to be rescued by a staff member because I got totally stuck. I acted as rescuer this time rather than rescuee! We had jumping basketball competitions. (I won, with a rather large height advantage.) We attempted to jump up a wall and failed miserably. We 90’s Gladiators style fought with some big soft batons, on a plank over a foam pit. I’m the only one tall enough for the ninja warrior courses so we gave those a miss this time. Their little kids area has been replaced by the inflatables so those are totally gone (as is the football area). However the bit that used to be the dodgeball zone now has a wee foam pit in the corner and seems to be aimed at little kids. Which is good to still have a wee area where they can play without bugging folk trying to do trampoline tricks! When our time was about up the kids went into the soft play area and had a wee play in there to finish. 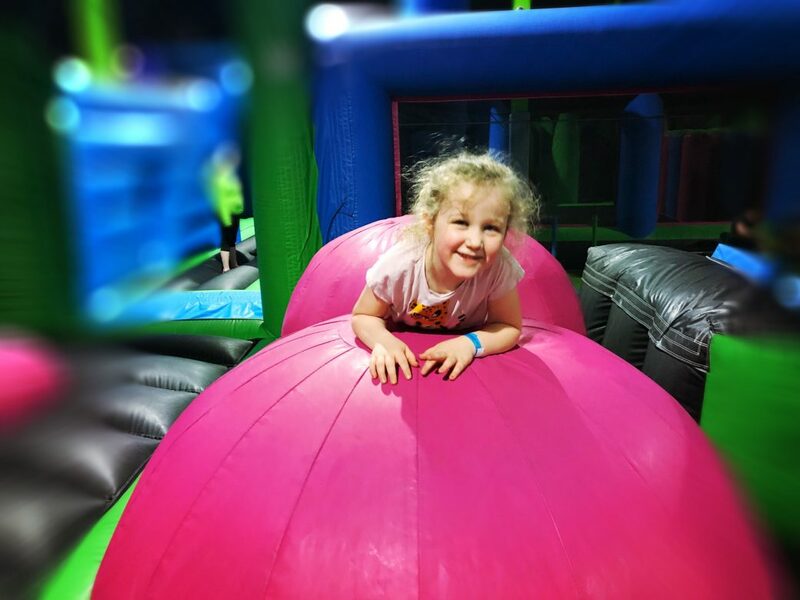 The soft play is good for little ones and slightly bigger ones as it has a separate area for very little kids with a small slide and some soft blocks etc. There’s also a bigger play frame that both of mine loved clambering around and heading down the big slide. The only problem was that they were so sweaty by this point that they just kind of stuck to the slide and wouldn’t slide down! It didn’t phase them – they just pulled themselves down anyway and went straight back up again. If you go after school with your kid, prices are £7 each for adult and kids for an hour – at least 1 adult has to be jumping. Standard entry is £11 for over 4’s and adults so £7 is a pretty good deal! For the 4’s and under, Mini Flippers is on during school hours and is £4 each for a child and accompanying adult. (I wrote about this a while back – you can find all the info here). Evenings and weekends the 4’s and under are £5.50 each for child and accompanying adult. I had a brilliant time jumping about in there. The kids did too. They absolutely loved it! We found it was such a good way to spend an hour after school, burning off all that excess energy that kids always seem to have. We’ll definitely be back.